Embarking on a crusade on behalf of your kingdom? Guarding a mysterious and powerful artifact from dangerous foes? Heading to the renaissance faire, and can't decide what to wear? 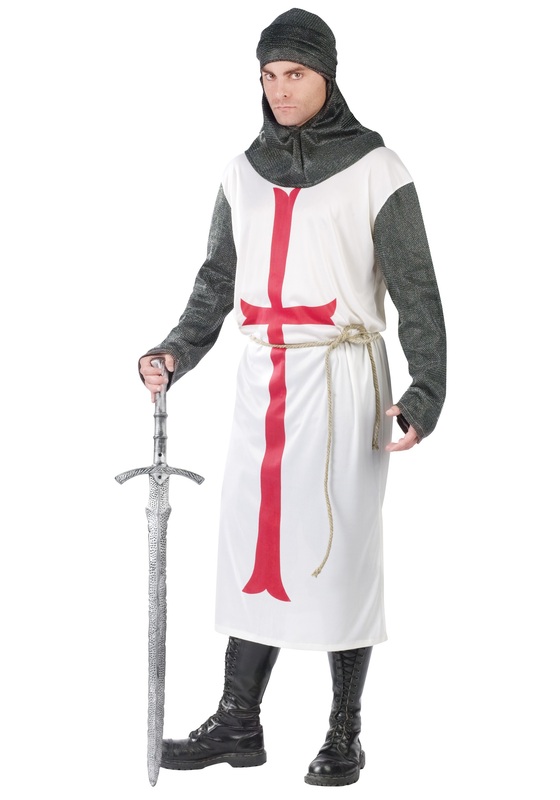 The one thing all of these situations have in common is that this Men's Templar Knight Costume with give you the heroic look you need to be victorious! Back in Medieval times, if you were trekking across the realm with nefarious intent, you'd probably want to stay away from any Templar Knights you came across. The good news was that they were easy to spot in their white tunics with the big red crosses on them (and also the gleaming swords they carried); but the bad news was that they were some of the fiercest and best equipped fighters you could find. That's only bad news if you were on their bad side, though. If you were skilled and dedicated enough, you could always join their order and become a Templar, and then you'd be fighting alongside the very best! Okay, maybe becoming a Templar Knight was a little more complicated than swinging a sword and paying a monthly membership fee; but when you're donning this dashingly heroic costume, you'll appear up to the task! Armor up in this long white and red cross detailed tunic with its attached metallic mesh sleeves and the matching hood, which resemble sturdy chain mail. Add a pair of rugged looking boots and a fierce longsword to tote around as you carry out whatever quest you're charged with!